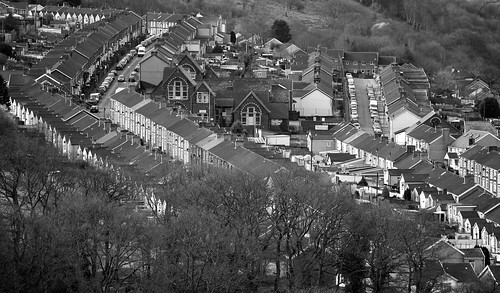 Posted by Stuart Herbert on December 21st, 2010 in A4054 (Merthyr Road), A470 Trunk Road, Desktop Wallpaper, Modern, Pontypridd. 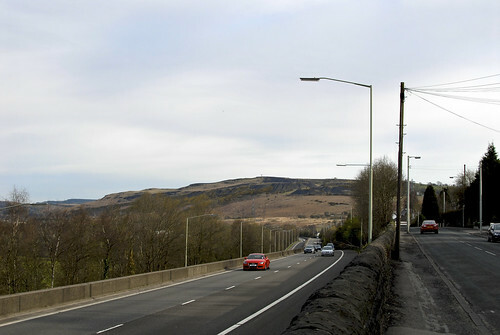 One of the reasons we chose to move to Pontypridd was that it’s got excellent road and rail links, including the impressive A470 trunk road. 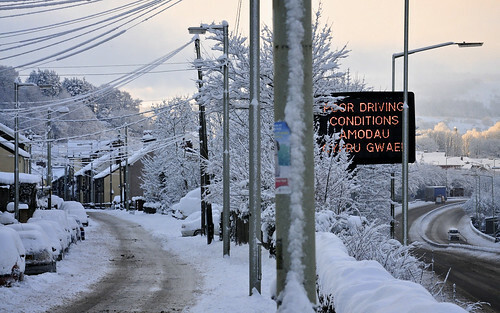 But on Saturday, the recent and unseasonable winter weather turned both the A470 and its predecessor (renumbered the A4054) into snow-bound car parks for the morning. 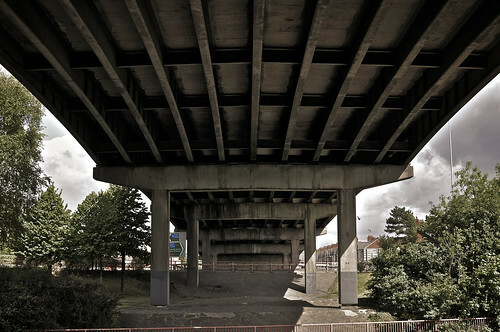 Posted by Stuart Herbert on August 5th, 2010 in A470 Trunk Road, Cardiff, Cardiff Railway, Coal, Modern, Photos, Shoot. 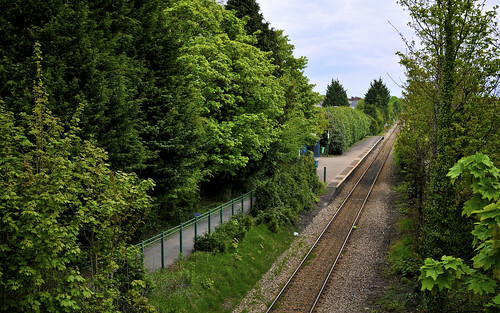 Viewed from the bridge that carries the A470 over the Coryton Line, Whitchurch Railway Station looks a sleepy little station well buried amongst greenery. Looking west along the tracks, you can clearly see the bridge that carries the A470 over the track, and the odd little kink in the track as it approaches Coryton Railway Station just out of shot. The station itself is small and functional. Unlike some of its neighbours, it has no CCTV cameras at the time of writing. 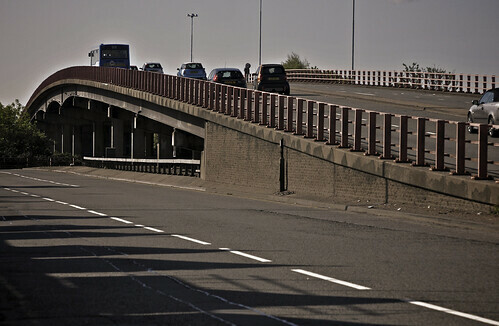 Posted by Stuart Herbert on August 2nd, 2010 in A470 Trunk Road, Cardiff, Modern, Photos, Shoot. 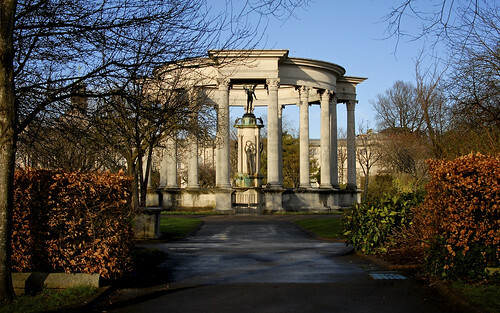 One of the great pleasures of visiting Cardiff is taking a stroll through Alexandra Gardens, part of Cathays Park. 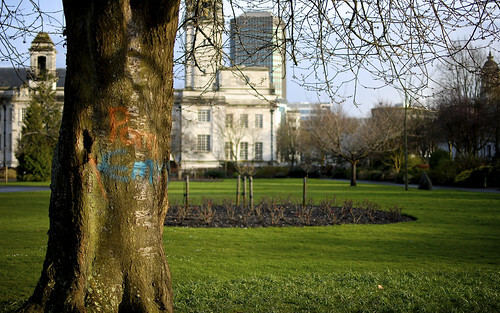 Standing at the heart of Cardiff’s historic civic centre, Alexandra Gardens is overlooked by law courts, university buildings, police station, national museum, local and welsh government offices, and the falcons that nest in the clock tower. It is a legacy of the wealth extracted from the valleys to the north and brought down to the docks by canal and competing railways. It’s also one of the cheapest and most convenient places to park your car in Cardiff, if you happen to be a local who knows such things. And that’s why I found myself wandering through the park back in March 2010, trying out my new Nikon 35mm lens for the first time on my way to meet some fellow bloggers and the Guardian Cardiff correspondent at a pub in the centre of the city. 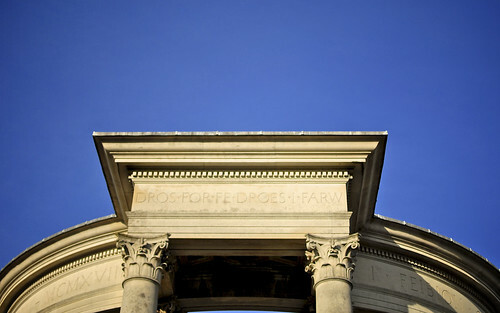 Late March is a great time to photograph Cathays Park, as the low sun has just enough colour in it to bring the portland stone to life. I’m afraid I can’t translate the inscription that runs around the top of the cenotaph. If you can, please leave a translation in the comments. 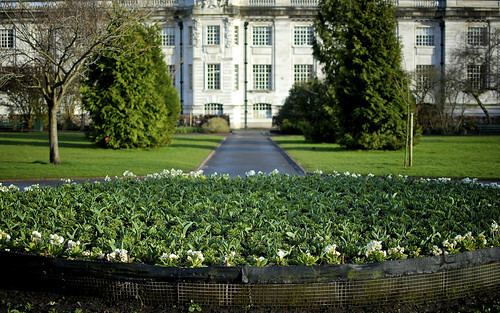 The park is very popular with students from the University of Wales, Cardiff, which occupies many of the buildings that surround the park both to the east and the west. 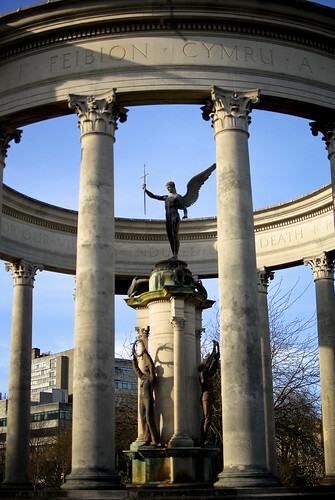 This is the Welsh National War Memorial, unveiled in 1928, as a remembrance to soldiers, sailors and airmen who died in the Great War of 1914-1918. The statue on top represents Victory. Looking south (with the Cenotaph behind me) across Alexandra Gardens towards the back of City Hall. Just out of picture, to the right, is the famous clock tower, currently home to nesting peregrine falcons. 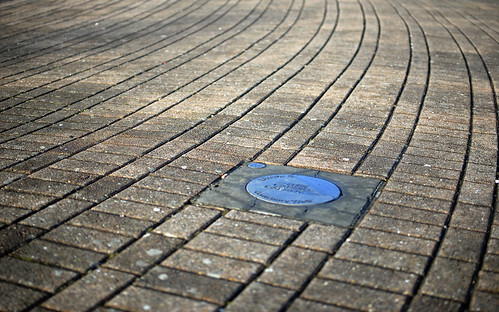 In 2005, a 41-point walk around the centre of Cardiff was created to celebrate 100 years of Cardiff officially being a city. Point 25 can be found beside the Welsh National War Memorial. 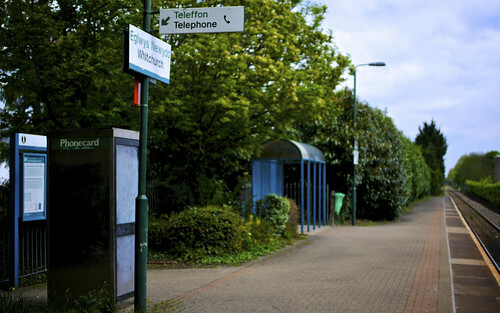 Posted by Stuart Herbert on July 20th, 2010 in A470 Trunk Road, Bute Docks, Cardiff, Desktop Wallpaper, Glamorganshire Canal, Modern, Taff Trail. 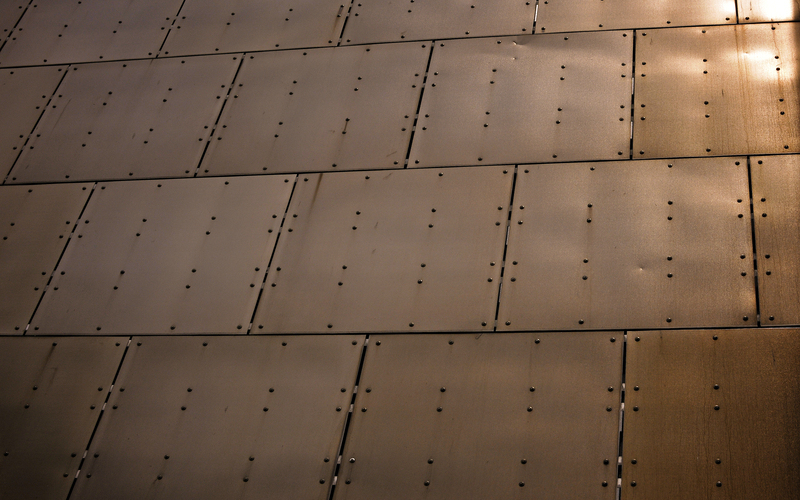 Continuing this week’s theme of great slabs of single colour, my desktop wallpaper today is this shot of the wonderful copper roof of Cardiff Bay’s Millennium Centre. There’s something about the rich look of burnished copper. Definitely something I could look at all day long! 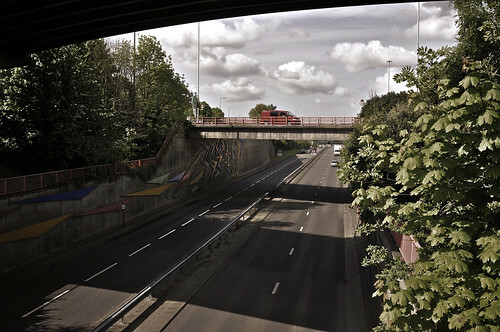 Posted by Stuart Herbert on July 7th, 2010 in A470 Trunk Road, Cardiff, Leisure, Modern, Photos, Shoot. If you regularly drive into and out of Cardiff along the A470, you’ve probably noticed that, hidden just behind the houses to the east, is a sizeable open area. 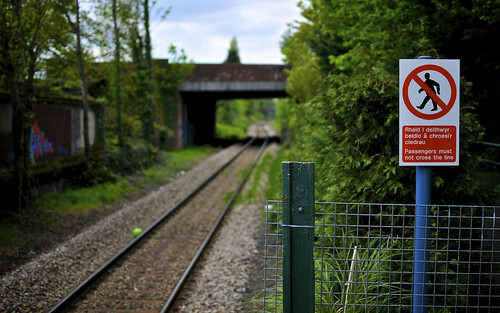 Bounded to the north by the Coryton line (the surviving stretch of the old Cardiff Railway line), and to the south / east by Rhydwaedlyd Brook stands Caedelyn Park. The brook itself is largely fenced off (presumably because of the amount of children who play in the park), and at one point along the fence is a little slipway down into the brook. 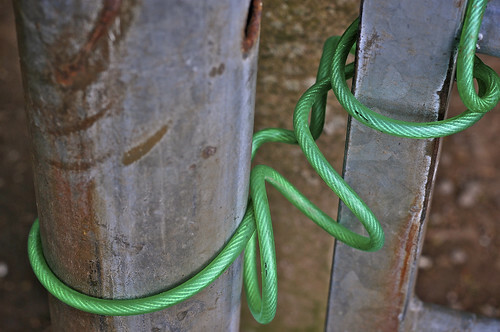 This slipway is secured by the gate shown in this photo, and its rather eye-catching green-sheathed security cable. 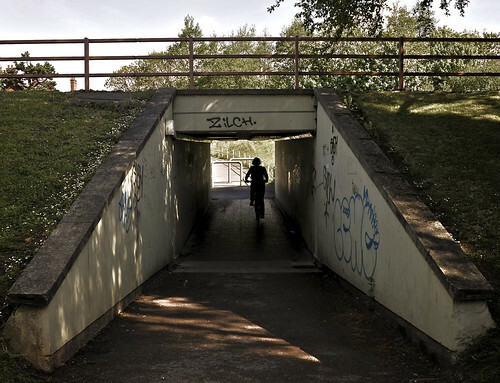 Posted by Stuart Herbert on June 28th, 2010 in A4054 (Merthyr Road), A470 Trunk Road, Coal, Glamorganshire Canal, Modern, Photos, Pontypridd, Shoot. Cilfynydd today stands on the northern edge of Pontypridd as it creeps up the Taff valley towards Abercynon and beyond to Merthyr Tydfil. It sits to the east of the route of the Glamorganshire Canal (now buried beneath the A470 trunk road). Most of the old terraced housing was built between 1884 and 1910, with the population exploding from a hundred or so people to over 3,500! This sudden population of what was originally a farming hamlet was driven by the opening of the Albion Colliery (closed 1966; today is the site of Pontypridd High School) in 1887. The village suffered great tragedy and loss in 1894 when 290 men and boys were killed by a massive underground explosion in the colliery. 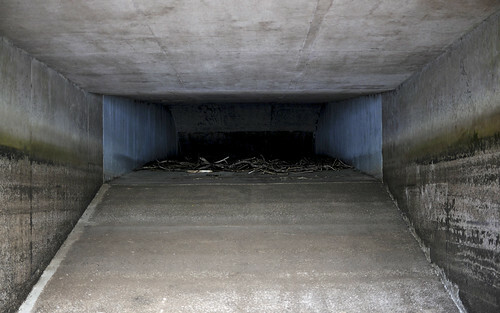 Posted by Stuart Herbert on June 26th, 2010 in A470 Trunk Road, Llwyn Onn, Modern, River Taff, Shoot, Taff Trail. 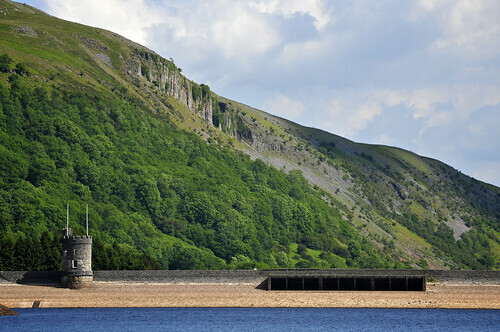 Completed in 1926, Llwyn Onn is the southernmost and largest of the three reservoirs built across the Taf Fawr to supply water to Merthyr Tydfil and the valleys south to Cardiff. With unsually warm and dry weather so far in 2010, water levels at Llwyn Onn have dropped dramatically, revealing Pont-yr-Daf and allowing safe access along the retaining wall to the sluice gates at the southern end. 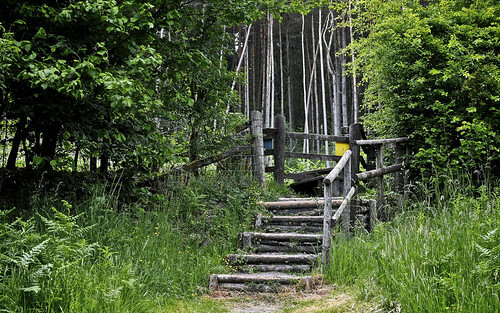 The Taff Trail (national cycle route 8 ) runs down the western edge of the reservoir, and from the road there are plenty of paths like this one that you can use to walk down to the shores of the reservoir. 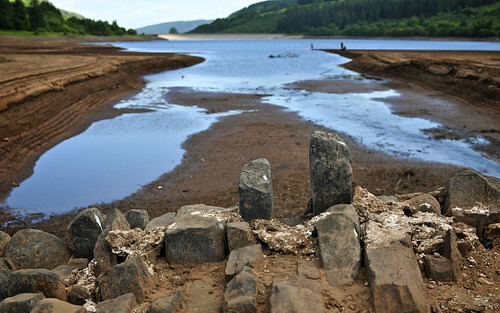 When the reservoir is at normal levels, Pont-yr-Daf lies underwater. But current water levels have fallen low enough to reveal the bridge – the only surviving structure from when the reservoir was created. This shot is looking north … note how the whole northern end of the reservoir is both silted up and completely dried out. 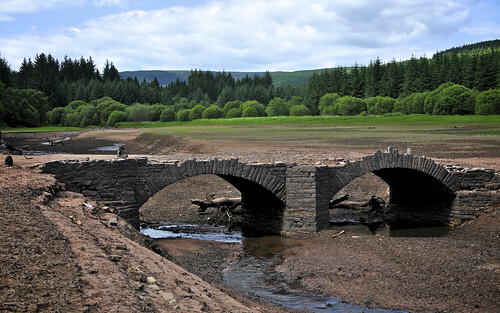 Another shot of Pont-yr-Daf, showing the low water levels as we look south down the reservoir. On reflection, I should have taken this photo at f/8, and made it sharp front-to-back. A lesson for future shots, I think. 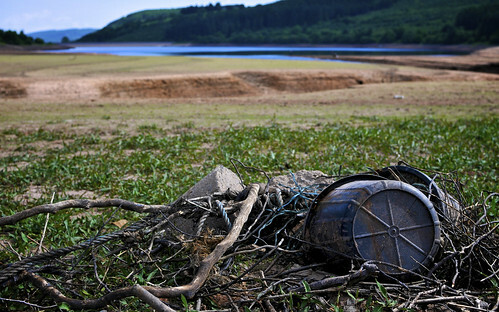 Here’s a pile of human junk out in the middle of the drying Llwyn-Onn reservoir. Note how green the ground is starting to turn at this spot. My wife reckons the ground here could have been exposed for about a month for these plants to take hold like this. 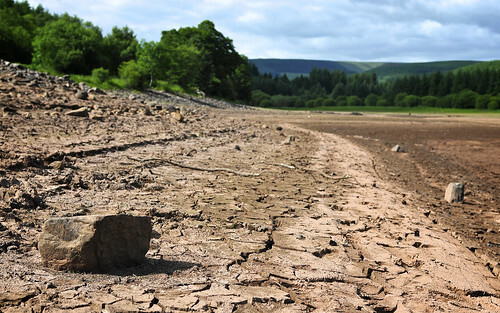 The Llwyn-Onn reservoir is completely dry north of Pont-yr-Daf. From the bridge itself, you can clearly see how the water is retreating south towards the reservoir’s retaining wall. 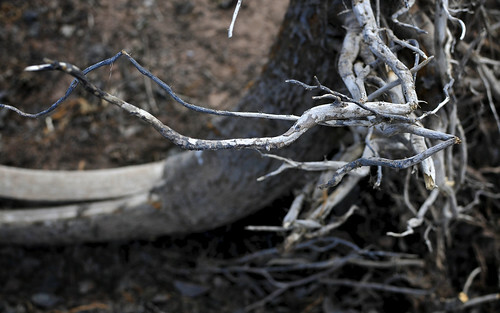 This is a close-up shot of a tree that had been washed up in the reservoir at some point. 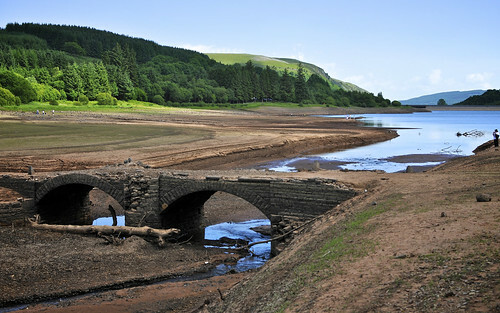 The water levels at the Llwyn Onn Reservoir north of Merthyr Tydfil have fallen quite low this year, exposing all of the northern end of the reservoir bed. It is drying and cracking up quite nicely. As the water level drops, the reservoir bed is being slowly uncovered. At first, the bed is a horrible sticky mud, and until it dries out it’s a bit tricky to walk on. The local fishermen have solved this problem, by creating stone pathways out to the water and extending them as the water level continues to drop. Here’s a shot of the reservoir retaining wall, looking south along the reservoir towards Merthyr. You can clearly see how far the water stocks have fallen already this year, and summer is only just beginning. 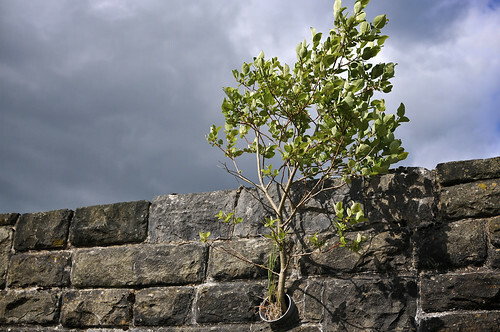 At the top of the retaining wall, my wife spotted this tree growing out of a drainpipe. It certainly looks like it has been here for some time. With the water levels so low, we were able to carefully walk out along the reservoir wall to the sluice gates. To stop debris being flushed into the sluice gates (and, presumably, to stop nosey photographers from doing something silly and ending up falling down the gates!) 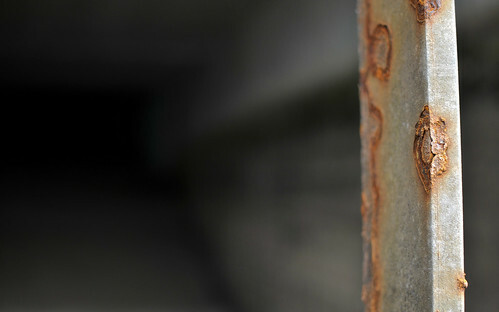 there are these metal bars across all of the sluice gates at the reservoir. 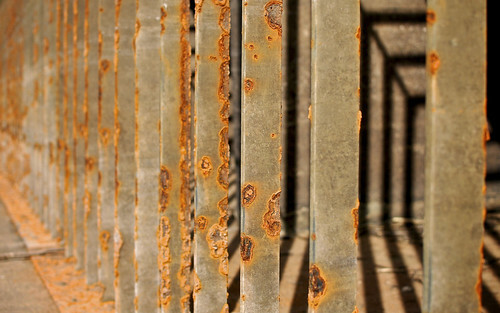 View this photo at ‘large’ or better on Flickr … the rust patterns in the bars are quite something. 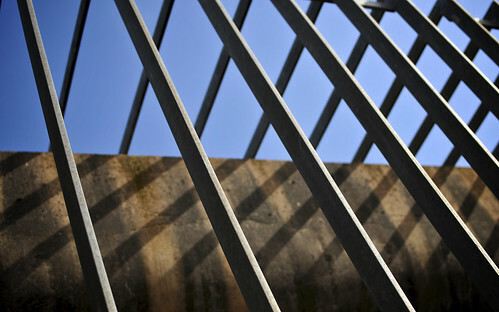 Behind the bars lie the sluice gate itself … but what does it look like and where does it go? This is what the bars are protecting … one of the sluice gates at the reservoir. Not far into the blackness there must be quite a drop down to the valley floor below. We didn’t go and explore the other side, so I couldn’t tell you whether the gates empty into the river below or into the water plant. Either way, it’s a ride that you don’t want to try. 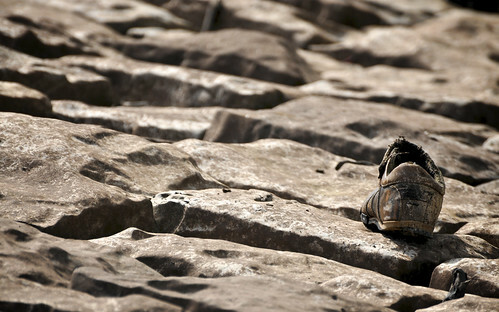 Whilst clambering back along the reservoir wall after visiting the sluice gates, I spotted this shoe further down towards the receding water. I’m guessing it was washed up here when the water level fell, rather than being simply abandoned by someone else scrambling along the wall. Trelewis’s photos of Pont-yr-Daf; it was her shots on Flickr that convinced us to head up to the reservoir to see the bridge for ourselves! 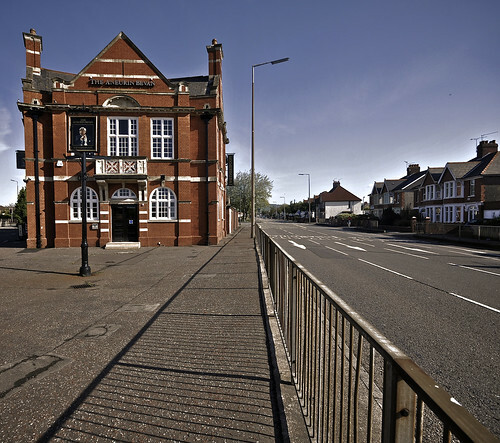 Alan George’s Cwmtaff page, including photos of the buildings lost when the valley was flooded to create the reservoir. brackenb’s photos of Pont-yr-Daf, including a shot in the comments from 1959. 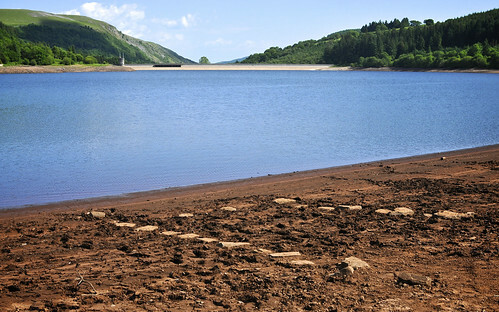 A list of the UK’s reservoirs on Wikipedia. 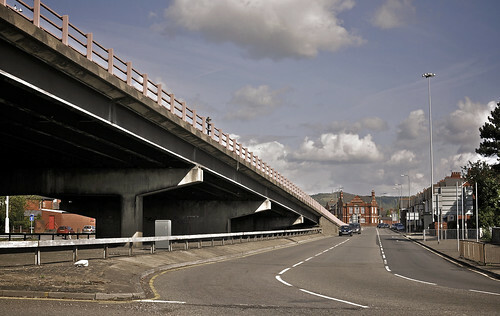 Posted by Stuart Herbert on June 25th, 2010 in A4054 (Merthyr Road), A470 Trunk Road, Glamorganshire Canal, Historical, Modern, Photos, Pontypridd, Shoot. … but whenever I stand at this spot and gaze north towards Navigation (modern-day Abercynon), sometimes it’s nice to dream of what the views might have been two hundred years ago, and one hundred years ago.